Ambassador Thomas Schnöll took up his duties as Permanent Representative of Austria to the OECD on 8 November 2018. Mr. Schnöll was born on 11 January 1971 in Salzburg, Austria. He is a lawyer and holds a Master in Law from the University of Linz (1994). To complete his education he attended the École nationale d’Administration (ENA) in Strasbourg. In January 1997, Mr. Schnöll began his career at the Austrian Foreign Ministry in Vienna as a Press Officer. From 1998 until 2001, he was Second Secretary of the Austrian Embassy in Paris. From 2001 until 2004, Mr. Schnöll was First Secretary of the Permanent Representation of Austria to the European Union, in Brussels. From 2004 to 2009, he was appointed Head of the Department for Western Balkans in the Austrian Foreign Ministry. In January 2010, Mr. Schnöll moved to Chicago (United States), where he served as the Consul General, at the Austrian Consulate General, for the subsequent three years. From 2013 to 2015, he became the Austrian Ambassador in Tirana, Albania. 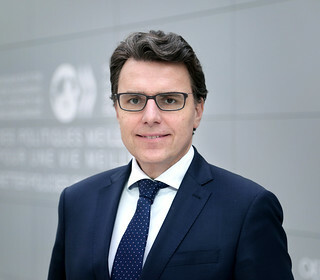 Prior to taking up his duties as Ambassador and Permanent Representative of Austria to the OECD in 2018, Mr. Schnöll acted as Head of the Department for Press and Information and, simultaneously, as the Spokesperson of the Austrian Ministry for Europe, Integration and Foreign Affairs. Mr. Schnöll is married and father of three daughters.